Covering everything from babies to boyfriends, break-ups to bikini bodies, an OK! Magazine will give you the inside scoop on the biggest stories, with a glossy mix of exclusive interviews, wedding photoshoots and snaps of your favourite singers, actors and reality TV stars on the red carpet, on holiday and on the move! Enjoy the best selling celebrity gossip magazine in the UK today! This offer is available for UK delivery addresses only. Offer for a limited time only. 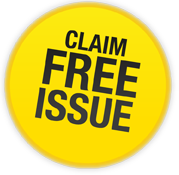 Your free issue will be the next available issue and delivered to you within six weeks of receiving your request.